Home Opinion What’s the Deal with Superdelegates? What’s the Deal with Superdelegates? “Super” delegates might sound cool, like they fly around caucuses and voting booths in a cape, but they are undemocratic. Not everything with the prefix “super” is super. While Super Tuesday was one of the most exciting days in the 2016 presidential election thus far, superdelegates diminish the vote of the everyday citizen and should be abolished. There are 712 of these suckers, comprised of sitting Democratic governors, sitting Democratic congresswomen and men, and previous Democratic presidents, vice presidents and party officials. This is where it gets interesting. Each superdelegate has one vote that they can allocate to any candidate they want. For example, Jerry Brown, a sitting Democratic governor, can pledge his delegate to whomever he wishes, no matter how the California Democratic primaries go. Superdelegates differ greatly from conventional delegates, which are allocated to candidates based upon the result of state primaries and caucuses — but both are crucial for the 2016 White House bid. Senator Bernie Sanders and former Secretary of State Hillary Clinton are racing toward the magic number 2,383: the number of delegates needed to become the Democratic nominee for the White House. As of March 2, Clinton has 457 superdelegates pledged to support her — over 10 times more than the 44 conventional delegates who were up for grabs in the highly contested Iowa caucus. Bernie Sanders, on the other hand, has 22 superdelegates pledged to support him. Superdelegates are a method to give Democratic Party insiders more influence in the primaries. Specifically, they work to oppose outsider candidates who might not adhere to the establishment platform. Superdelegates appear to be accomplishing their job by giving Clinton a “home party advantage” over Sanders. The Republican Party doesn’t have superdelegates; if they did, I’d suspect they’d flock to establishment candidates Marco Rubio or John Kasich to cut back the lead of candidates, like Donald Trump and Ted Cruz, who are riding a wave of voter frustration toward the presidency. An establishment candidate is regarded as someone who supports policies that are in line with this status quo rather than policies that could disrupt it and rock the boat. 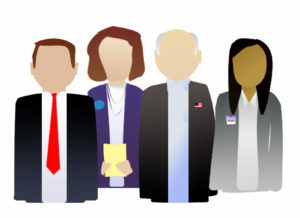 You may have never heard of superdelegates before — and that’s alright, especially this year. The 2016 race thus far has been saturated with anti-establishment sentiment and frustration. What if everyone knew that a sixth of delegates (about a third of the delegations needed to clinch the nomination) aren’t actually decided by the people — but party insiders? Not especially something I’d publicize, if I were an official in the Democratic Party. If it were publicized, Democrats might have a backlash comparable to the rise of the far right Tea Party. The Tea Party arose out of intense dissatisfaction for the political machines of the GOP and frustration with the political elite of Washington DC. But even if it were met with public outrage, they’re unlikely to change before this summer when the Democratic National Convention (DNC) rolls around; so for 2016, we’re stuck with ‘em. While Clinton has a commanding lead in pledged delegates, those individuals can change their minds at any point, up until they cast their vote at the DNC. Like former President Bill Clinton, some notable Democrats are probably not going to change their minds. But many remain undecided, including Gov. Jerry Brown, Minority Leader Nancy Pelosi and Congressman Sam Farr (who represents much of Santa Cruz). These officials hold a disproportionately large influence over who the Democratic nominee will be, and simply put, it’s not fair. The Democratic Party should recognize the political elitism it perpetuates by rewarding those already in power with even more power. The party belongs to the people, and the people deserve a political organization that will fight to amplify their voice, not diminish it. Co-Editor-in-Chief of City on a Hill Press. I like running, swimming and biking. Next step is probably a triathlon, but haven't gotten there yet.